known mechanisms of UV induced DNA damage in cells: excited by UV light, nucleotide bases begin to take part in photochemical reactions of cyclobutane-pyrimidine dimmer and (4–6) adducts formation. absorption DNA spectrum behaviour in the range 200 – 300 nm changes of absorption by bases under UV irradiation. photoluminescence charge transport behaviour of ds-DNA molecules in wet, dry adsorbed layers with bases changes under UV irradiation. Then the experimental investigations were carried out on 2 mM plant ds-DNA polymerized molecules (Eris, France ) that were dissolved in 3 mM NaOH buffer and 2 mM ss-DNA with 15 oligonucleotides bases: 3'-CCA CCG CTG CTG AGG-5', length 5,4 nm, wide 1 nm (Jena BioScience, Germany) were dissolved in 100 mM carbonate/bicarbonate buffer . We prepared ds-DNA polymerized molecules water solutions dissolving 0,1 ml of DNA in buffer solution in 1, 40, 50 ml of water showed a pH of 7,4 (the volume ratios are 1:1, 1:40, 1:50, correspondingly) and ss-DNA water solution dissolving 1 ml of DNA in buffer solution in 5 ml of water showed pH of 7,4. The solutions in quartz cuvettes were irradiated by UV (Л = 200–400 nm) during 5–90 min with the light power 1020 photon/(cm2 s). From absorption spectra of different concentration of ds(ss)-DNA molecules in water solution the influence of UV irradiation on ds(ss)-DNA molecule absorption were revealed. Photochemical reactions in the nucleotide base pairs with formation of dimmers and/or (4–6) adducts, that lead to the change of electronic levels structure of ds-DNA molecule and were revealed in absorption spectra (this spectrum is similar to presented in Figure 1): absorption maximum at 265 nm (4.7 eV) shifts to 269 nm (4.6 eV) – this caused by additional absorption on formed dimmers; maximum at 285 nm (4.3 eV) is absent – absorption on cytosine base becomes minimal: we assume that cytosine was used in dimmer formation. Absorption spectra of ss-DNA molecules in water solution in the range 220 – 300 nm before (a) and after UV irradiation: b, c,..m during 5, 10.... 180 min correspondingly. 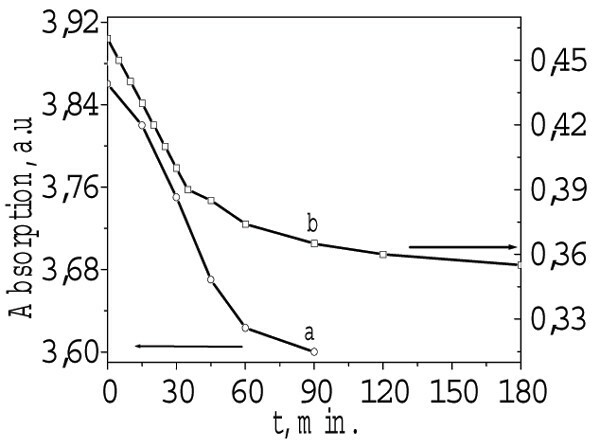 The dependence of ds-DNA absorption intensity (for wavelengths 252 nm) on UV radiation time is represented in Figure 2b. Almost all changes in absorption take place during first 30 min of UV radiation, in the comparison with ds-DNA it could be caused by smaller number of adjacent T and C in ss-DNA bases sequence. 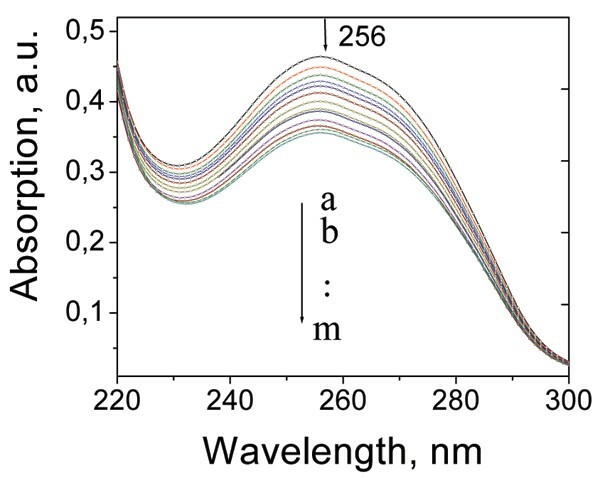 The band in short wavelengths (λ < 235 nm) with maximum at 220 nm is not sensitive to UV irradiation as and for ds-DNA. These results prove that the UV effect in DNA becomes apparent in the excitation of nucleoside bases (absorption maxima is 235–280 nm) and photochemical reactions in DNA chains. Absorption intensity of: a – ds-DNA molecules at 252 nm; b – ss-DNA molecules at 256 nm versus UV irradiation time. Photoluminescence spectra of wet dsDNA layer with networks have maxima at 432, 440 and 454, 463 nm before and after UV irradiation with 337 nm and 365 nm during one hour, respectively. The presence of photochemical reactions appear in the decreasing of photoluminescence intensity in this layer. Then it is possible intensive emission with participation of electronic states corresponds to molecular orbital systems in the nucleotide base pairs and sides of the ladder having a periodic structure with alternating sugar and phosphate groups. A part of the electron levels that determine photoluminescence spectrum can correspond the formation of dsDNA molecular networks. The presence of the photochemical reactions appear in the decreasing of dry absorbed ds-DNA molecular layer with networks conductivity under periodical switched UV irradiation: as a result the conductivity decreases after first radiation reflecting the reducing of pyrimidine bases (that formed dimmers) contributing to ds-DNA conductivity. The increase of the conductivity value after UV irradiation could be caused by the particular reparation of ds-DNA under applied voltage of 1 V.
UV induced ds(ss)-DNA damage in buffer solution and in wet, dry absorbed layer, using optical and photoluminescence spectroscopy, as well as conductivity was revealed. Models of UV induced ds(ss)-DNA damage were accounted in the photochemical reactions of cyclobutane-pyrimidine dimmer and (4–6) adduct formation were used to recognise ds(ss)-DNA damage in their absorption spectra and wet ds-DNA damage in photoluminescence spectra and in the behaviour of conductivity under periodical switched of UV irradiation. But it's important to develop offered methods for its further ability to direct evident possible photochemical reaction that took place in ds (ss)-DNA.